It can be a difficult age to understand the sort of gifts that your teenager desires but with this helpful list of birthday gifts for teens, you are sure to come across something for every teen’s fancy. Ranging from the technical to the decorative, there is something for everyone in this top list. This upgraded projector comes with 10% brighter projection than previous models making it sharper and brighter than before. With the versatility to connect to your phone, laptop and other devices, this high quality projector is the perfect birthday gift for a teen who can use it for home entertainment on a big screen. This portable wireless power charger will be loved by teens for its simple elegance and sheer practicality. By allowing you to charge any Qi-enabled device on the go, it’ll keep your devices topped up all day by charging one wirelessly and the other via the USB port supplied. For the artistic teen, this organizing device will be a god-send, keeping all their brushes in one handy place. It can be used for artist’s brushes, pens or pencils, and can also be used as a make-up brush holder. It has 49 holes within its circular organizer, enough for any purpose. This quadcopter has a fully stabilized 3-axis gimbal as well as 4k UHD recording, while its vision positioning system allows for stable flight indoors. Digital streaming allows live viewing of the 720p video which is also recorded on the internal micro SD card. Fun and practical, this quadcopter is an experience not to miss. This backpack is designed to discourage any robber with a hidden zipper and a secret pocket in the bag. There’s also an external USB with a built in charging cable and retro reflective tape on the front of the bag to make it more conspicuous at night. Comes with a 12 liter capacity. This modern timepiece has no buttons or plastic parts located on the front and four sides of the clock. An LED light glows through the wooden finish giving a modern look that matches perfectly with home furniture. Telling the date, time, temperature and featuring an alarm, this clock will improve any room. Your teen will love this groovy Bluetooth speaker that will allow them wireless music streaming and which has a rechargeable battery for music playback anywhere. There’s up to 12 hours of play time and an anti-clipping function for loud but distortion free music. A perfect gift for the modern generation. This terrific case is ideal for protecting their favorite iPhones as the case is dual layered with shock absorbent TPU and rigid PC for durability. There’s a secure closure which keeps safe the built-in card storage and other cash, and the sliding cover provides quick and easy access without giving any security issues. This clever and quirky clock will look great in their room and will be a centerpiece for discussion amongst friends. Forget using numbers to tell the time, and instead be enchanted by how this clock uses its matrix of words to convey the correct time to you all day. Give them the gift of science with this clever set of chemistry cards that explains all 118 elements in full photographic imagery and with descriptions of their properties and internal arrangements. Each card also has a scientific fact on its back and has suggested activities to aid study. Imagine being woken up by a gentle sunrise every morning – well, now you can with this wake-up alarm clock that has a clinically proven light therapy lamp for improving your sleep, energy and well-being. Wake up more refreshed in a more natural way with this clever alarm clock. For your travelling loved ones, comes this great birthday gift for teens. Let them record their first solo trips abroad with this travel stub diary which has clear sleeves allowing you to gather all your postcards, maps, brochures, ticket stubs and snapshots in one place with plenty of space to jot down every detail. Teens love to experiment and now they can produce their own detox drinks with this durable infuser, made from thick single wall borosilicate glass. There’s a neoprene sleeve for extra protection and a removable two-piece stainless steel infuser for adding fruit, tea or coffee to their drink. This simple gift may just be a life saver to often discarded ear phone cords. Made from prime leather material, this organizer allows ear phones to be stored securely and without any wires hanging loose but yet allowing quick and easy access. Light and compact, it provides a simple solution to a modern problem. Turn their iPhone into a printer and sticker machine with this funky gift they will love you for. They can watch photos print in seconds from their phone and all with no ink being necessary as they are printed onto Zink Sticker paper which has a peelable backing, turning the photo into a sticker. When your teen is travelling on coaches or other forms of transport, or simply laying their head down somewhere strange for the night, then this gift will keep their neck in comfort no matter the position. Ultra light and with a comfort clip for no-slip sleeping, this is the ultimate travel comfort solution. With the comeback of vinyl, this welcome gift will allow your teen to benefit from old style listening but with the means to record to modern devices. It has an anti-skating design, a built-in Phono equalizer amp, and corrosion resistant gold plated terminals for great sound at all times. It’s an important fact of modern day life that we need to stay hydrated, and now your teen can with this funky collapsible water bottle. The bottle rolls up for compact travel and loops around a wrist for easy carrying. Tough and durable, it’s leak proof and made from 100% food grade materials. This camera is customizable in that it can be drawn on and creatively adorned with all sorts of decoration but still works as a great 35mm camera. Using real film which can be developed in a store, this camera comes apart to be adjusted to just how you want it to look. Now that your teenager has house and car keys, you need to make sure they don’t go missing causing expense in changing locks. This terrific little tracking device works via your smartphone to enable you to track your keys’ whereabouts by means of the signal sent by the attached device. Retro has become cool and in terms of gaming, this is retro at its best. This NES classic edition has the original look and feel of the popular gaming system but comes loaded with 30 games from its heyday. There’s also a classic controller, a standard HDMI cable, and an AC adapter. These one piece glasses say cool and are today’s height of fashion. Coming with a cleaning cloth and a carry bag, the glasses give 100% protection against harmful UVA/UVB rays whilst maintaining a chic look that your teen will just love as they strut their stuff on the beach. This fantastic light box will allow teens to put up their own messages in their room. Complete with 109 letters, numbers and symbols, the light box is fully customizable and their world can be lit up with fun quotes, memorable sayings, or simple daftness they’ll all laugh at. This super portable device can be linked into most Bluetooth enabled media devices to provide powerful and room filling sounds. There’s up to 6 hours of playing time with the in built lithium battery which can recharge in just 3 hours with the included micro USB cable. To help keep that room tidy, this piece of decor comes to the rescue. Practical and decorative enough to blend into the room, this caddy can hold magazines, phones and cords safe. The TV remote now has a safe place to live! A great birthday gift for teens to help organize their den. This clever combo allows you to keep refreshed and hydrated whilst keeping your keys and other important small personal items with you. The neoprene pouch keeps a 23 ounce bottle cold while zippered storage keeps your other items safe. There’s a handy hand strap for easy carrying, too. Selfies are all the rage today but when it comes to a night time selfie, results are mixed. Now you can ensure that your selfies are clear and bright no matter what time of day it is with this LED fill light for cell phones and tablets. As your teen departs on their travels, pack them off with this handy musical instrument, in the form of a foldaway guitar. With 19 frets, a space saving design, and made from American maple, this guitar will suit left or right handed players and sounds like a regular acoustic guitar. Looking like a spacecraft from a 60s B-movie, this wireless floating speaker will tickle the senses of your teen. Award winning and the world’s first Bluetooth elevation speaker, this device is no gimmick but has the technology on board to back up its stunning visual appearance. This cool looking guitar offers incredible comfort, top fret access and a sound that is perfect for on stage performance. The specially designed bracing maximizes body resonance for a full and natural tone. With a lifetime warranty and an under-saddle piezo pickup, this is a quality instrument. This is an ideal birthday gift for teens who are inspired by fitness. With a sleek wrist band that is comfortable all day, this device displays your fitness stats including, steps, heart rate, distance and much more. You can also control your music from your wrist as well as receiving social media alerts. Teens will love this funky looking instant camera with its bold colors and slim and light body. It has automatic exposure measurement helping you capture the perfect picture every time as well as a high key mode giving that softer look to portraits. A great look and a great camera. To help teenagers when they go through depressive patches to see the cheerier side of life, get them this diary that uses the science of positive psychology to improve happiness. By focusing your attention on the good in your life, this journal helps improve your mental well-being to help you feel better every day. This rustic looking backpack is made of sturdy 16oz canvas and has 6 pockets on the inside ranging from a laptop compartment to simple open pockets. With durable zipper closures and quality zippers, this bag will stand the test of time and be a boon during college years. This Bluetooth speaker set will look great in any room and will allow your teen to take their music where they want without a fuss of wires and plugs. Its elegant front facing look is minimal with no buttons or screens showing. A classy gift for a music lover. This classical take on a favorite child’s toy will delight any teen as they relive their younger years in the comfort of their home. With a natural wood look, the unit comes with a sculpting tool allowing creation of little masterpieces on your dining room table. This moisturizing cream is a quality purchase, which will be appreciated by all teenagers who are worried about their skin and appearance. For those who use make-up frequently, this product will keep their skin moist and vivid, retaining the youthful look they already have. This great indoor trainer will get you balancing perfectly with practice. Super fun to use, the smooth rolling lightweight and ultra tough roller reduces vibration and sound. There are no tracks or grooves which means movement is free and easy, however you employ the device. Designed and made in the USA. For those that love the extreme outdoor life, this camera will be a joy as it can record all their exploits with top quality video which includes a slow motion playback. There’s built in Wi-Fi and Bluetooth support and customizable settings for night time shooting. Perfect for capturing those treasured daredevil activities. Stuck for ideas for your teen girl’s sleepover? Well then, check out this helpful blog which gives an abundance of ideas of how to make a sleepover fun on a small budget. With plenty of color photographs, this blogger Mom shows you the thriftier side of having the girls over for the night. Ever wondered what your teen girl can get their bestie as a gift.? If so, check out this helpful blog which details how to put together a basket of useful products that a girl can pamper herself with. With plenty of ideas and photographs, this will get your imagination stirring. Teens love a bit of jewelry and now you can make some that comes from the most unlikely place. Using an old baseball, this blog shows you how to turn it into a stunning bracelet that will suit any occasion and will have any sports lover in a whirl. Do you feel as though your teen has everything already? If that’s the case, you’ll be pretty stumped for ideas when their birthday or special occasion rolls around. When you need some inspiration, our list has plenty of gifts for teens ideas, and we’re confident the right gift is in here. Let’s face it, men are impossible to shop for. Even when you get the right gift, their reactions can be so unemotional that you’re still not sure it was the right gift. So this year, give him a unique birthday gift, something surprising and different, that will throw him off balance and bring out true joy. 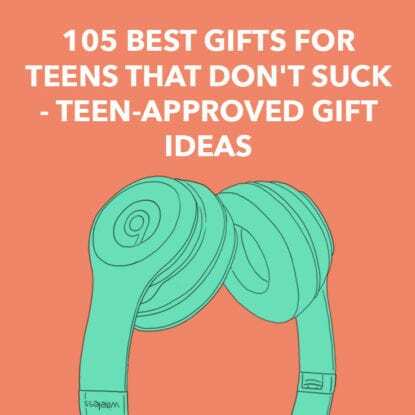 No matter your young adult’s interests and hobbies, we promise you’re going to find some super thoughtful and unique gifts for teens right here. From cool subscription boxes to genius bluetooth speakers, or even gorgeous makeup palettes, we have it all.